Times of San Diego took home 23 awards Tuesday night, and won Best News Site for the second straight year, at the San Diego Press Club’s Excellence in Journalism Awards. Times contributing editor Ken Stone, with 14 awards overall including six first-place plaques, combined with wife and contributing photographer Chris Stone (six awards) as the most-honored couple at the 44th annual awards at the Jo & Vi Jacobs Center at Market Creek. Writers, editors and photographers for TimesOfSanDiego.com, launched in March 2014, claimed nine first-place awards, eight second-place awards and six third-place awards. Hundreds of people attended the 44th annual awards dinner, emceed by retired broadcast veteran Hal Clement, sampling fare from dozens of local restaurants, wineries and breweries. 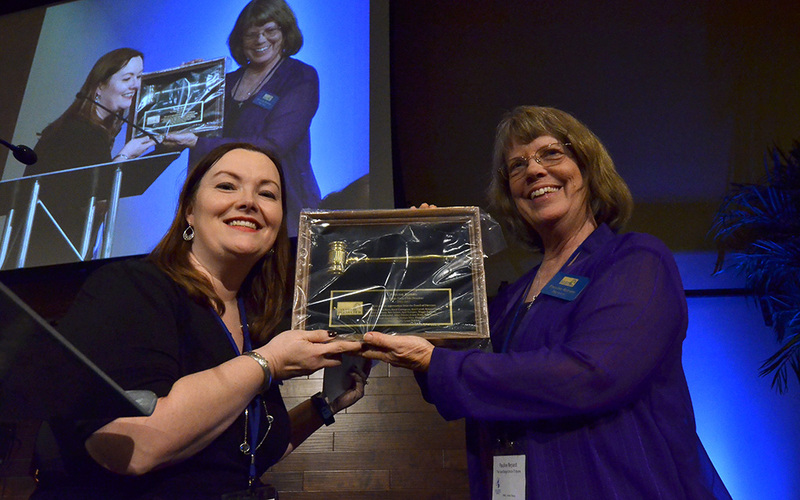 Press Club executive director Terry Williams said members submitted nearly 1,200 entries in daily, nondaily, magazine, radio, TV and college media categories. Judges included reporters and editors who are members of press clubs in other major U.S. cities, including New Orleans, Los Angeles, Milwaukee, Tulsa, San Francisco and Denver, as well as statewide press clubs in Alaska and Florida. 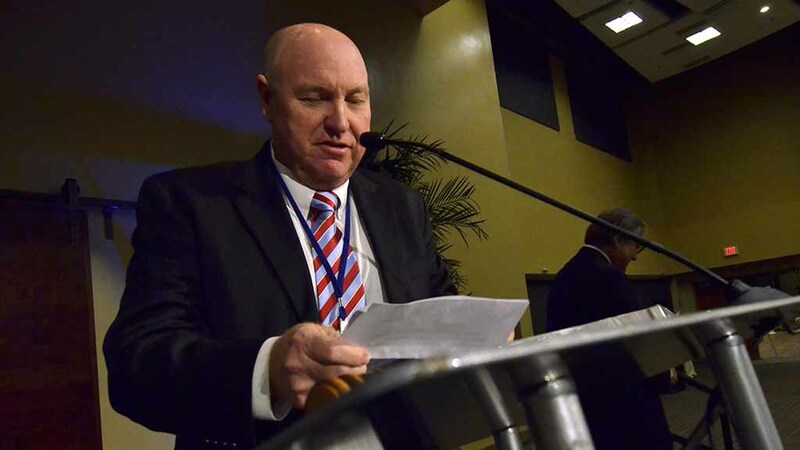 San Diego newspaper veteran Andrew Kleske, The San Diego Union-Tribune’s reader outreach editor, received the Harold Keen Award for outstanding contribution to journalism. Times columnist [“MarketInk“] Rick Griffin won the Andy Mace Award for outstanding contributions to public relations. And fishmonger Tommy Gomes, brand ambassador of Catalina Offshore Products, won the Press Club Directors Award. Union-Tribune courts and public-safety reporter Pauline Repard, declaring the event a “fake-news free zone,” handed the president’s gavel to Kristen Castillo. 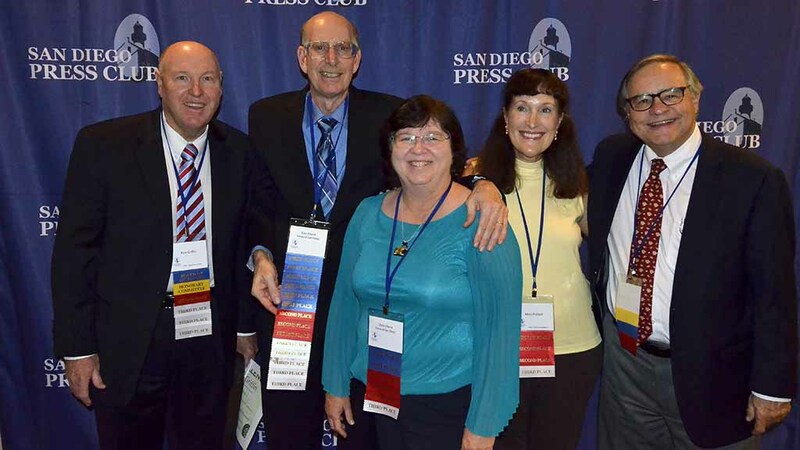 “The San Diego Press Club annual journalism contest proves that fine writing, fearless investigative reporting, thoughtful commentary and engaging photography not only still exist in San Diego County, but can be found abundantly,” Repard said. Castillo is the 42nd club leader since its founding in 1973 — and the seventh straight female president. Also at the event, two Point Loma Nazarene University students were each presented $2,000 scholarships from the San Diego Press Club Foundation. They were Ombretta Di Dio (Joe Lipper Scholarship) and Natalie Rocha. Other media outlets boasting multiple award winners were The San Diego Union-Tribune, 30 awards, Southwestern Sun, Southwestern College school newspaper (30); Ranch and Coast Magazine (25), San Diego LGBT Weekly (22), San Diego Business Journal (22), Ramona Home Journal (15), La Jolla Light (12), NBC 7/39 (11, the most among TV stations in San Diego), News Radio 600 KOGO-AM (8, the most among radio stations in San Diego) and San Diego Zoo Global and ZOONOOZ Magazine (8, including four first-place awards in various categories). The San Diego Press Club’s journalism awards is among the largest regional competitions in the country. More than 538 awards were presented in 188 categories. Press Club officials said the number of entries has risen 30 percent in the past two years with the addition of new categories, such as “travel, domestic” and “travel, international,” rather than one travel category.